Western blot analysis of total extracts from various cell lines using Axin1 (C7B12) Rabbit mAb. 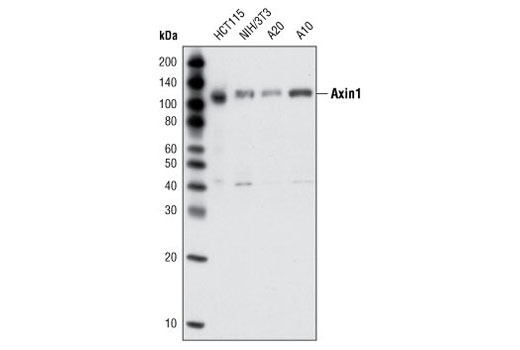 Axin1 (C7B12) Rabbit mAb detects endogenous levels of total Axin1 protein. Monoclonal antibody is produced by immunizing animals with a recombinant protein consisting of the N-terminal region of human Axin1. Axin1 (Axis inhibition protein 1) and Axin2 are multidomain scaffold proteins that negatively regulate Wnt signaling. Axin1 interacts with APC, GSK-3β, Dvl, and β-catenin and promotes the GSK-3β-mediated phosphorylation and subsequent degradation of β-catenin (1,2). Upon stimulation of cells with Wnt, Axin1 is recruited to the membrane by phosphorylated LRP5/6, a process that is believed to be crucial for activation of Wnt signaling (3,4). In addition to its role in the Wnt signaling pathway, Axin1 forms a complex with MEKK1 and activates c-Jun amino-terminal kinase (JNK/SAPK) (5). Axin2 (also known as Conductin or Axil) can functionally substitute for Axin1 in mice (6). Axin2 itself is a direct target of the Wnt signaling pathway and therefore serves to control the duration and/or intensity of Wnt signaling through a negative feedback loop (7-9). Luo, W. and Lin, S.C. Neurosignals 13, 99-113. Salahshor, S. and Woodgett, J.R. (2005) J. Clin. Pathol. 58, 225-236. Zhang, Y. et al. (1999) J. Biol. Chem. 274, 35247-35254. Chia, I.V. and Costantini, F. (2005) Mol. Cell Biol. 25, 4371-4376. Jho, E.H. et al. (2002) Mol. Cell Biol. 22, 1172-1183. Lustig, B. et al. (2002) Mol. Cell Biol. 22, 1184-1193. Leung, J.Y. et al. (2002) J. Biol. Chem. 277, 21657-21665.